They only come in four cylinder, 2.0 liter capacity in different states of tune so it doesn’t matter if you opt for the D4, D5, T5 or T6. Those are model designations and have nothing to do with engine capacity or cylinder count. The eingines produce between 140Kw and 235Kw while torque ranges from 350Nm to 480Nm. My personal favourite being the D5 turbo diesel producing 173Kw of power and 480Nm of torque transmitted to all fours using an eight speed Automatic transmission, smoothly willing you from one ratio to the next. It’s a graceful affair indeed. Once the shock of the Hitman looking Volvo subsides you step into the realm of oppulance and exclusivity, also known as the interior. It certainly is a thing of beauty. The entire dash is focussed around a 9 inch tablet smack in the middle of a luxuriously crafted Swedish lounge. Everyting is covered in leather, wood, posh plastic and dull, but expensive looking metal bits. 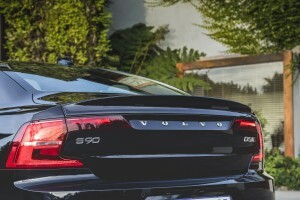 The Thor’s Hammer headlights and full LED if somewhat awkward looking taillights make another appearance as per modern Volvos, but some new features include a 360 degree camera system to help you avoid those curbs with those enourmous wheels. The 19 speaker Bowers & Wilkins audio system is practically religious in it’s performance and quite frankly the Volvo S90 puts its competitors to shame. Not only is it larger than the competition, it also betters them on standard features as well as fuel consumption and emissions. It uses five litres of diesel per 100km for goodness sake! As mentioned before the standard features list is comprehensive and highly rewarding with items such as active bending lights, the 9 Inch In-dash infotainment tablet as well as a 12 inch digital display where the instruments use to be. 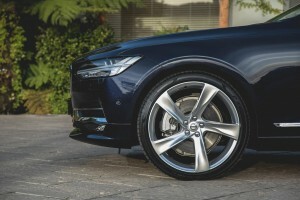 But the Volvo S90 goes even further and offers as standard adaptive cruise control with pilot assist which brakes, accelerates and even steers on your behalf using a plethora of cameras and sensors mounted all round. Options are more superficial boasting items such as bigger wheels, a sunroof, metallic paint and automated boorlid as well as electrically folding rear seats. Air suspension and smartphone integration as well as keyless entry and start are a few more optional highlights, but you can have it all if you play clever. Buy the most affordable S90, the D4 with the 140Kw/400Nm engine for R680 000 and use whatever you saved to get those amazing 21 inch wheels. It’s the right thing to do. 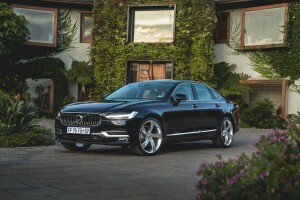 At R680 000 it also betters them on price and Volvo now sells their own insurance for under R1000 a month with all S90s. Yes a 5 series BMW handles better around a track and Audi still builds a better interior, if somewhat bland in comparison to the S90, but as a comprehensive package and as a high value deal, the Volvo S90 simply cant be beat.